Updated 5/22/18 at 6:15 p;m. Class 7A state championship series has been postponed on 5/22/18 and will be played on Thursday at State Mutual Stadium in Rome starting with a doubleheader at 1 p.m.
Where: State Mutual Stadium, Rome, Ga..
Gwinnett County rivals Mill Creek and Parkview play each other during the regular season every year. 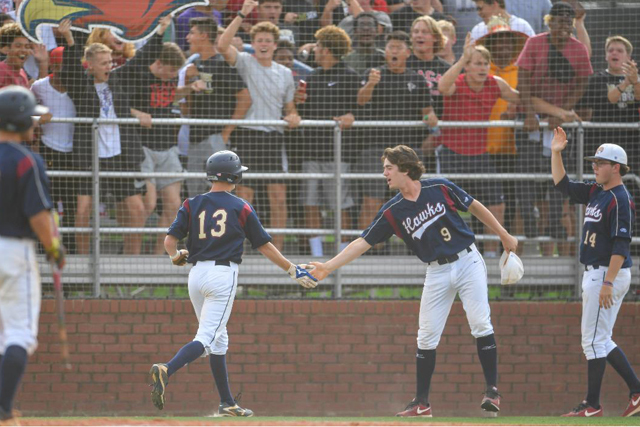 Just because Mill Creek took a 5-3 victory on Feb. 27, coach Doug Jones doesn’t want anybody to believe his Hawks are the favorites when the two powerhouses meet for the GHSA Class 7A state championship on Thursday at the Rome's State Mutual Stadium. The first game of the doubleheader starts at 1 p.m. The series was originally scheduled to start on May 22 and be played at Georgia's Foley Field. However, rain postponed the series on Tuesday and the GHSA moved it to a new venbue. Mill Creek is playing for its first state title since the school opened in the fall of 2004. The Hawks have used a lethal pitching staff consisting of right-handers Brandon Blume and Davis Sharpe. Closer Alaska Abney has been exceptional, especially in the postseason. He helped force a Game 3 in the semifinals against Brookwood when he threw six innings of one hit baseball. On offense, Sharpe and catcher Alek Boychuk are batting better than .400 and have the power numbers to prove it. The pair have combined to hit 16 homers and 70 RBIs. Designated hitter Parker Landua and shortstop Brendan York have also been consistent at the plate. The Hawks will meet the Panthers who also feature a stout pitching rotation led by left-handers Robert Bennett and Braden Hays. Parkview has used right-handers Jarrett Embry and Brad Stanley in middle relief, while all-everything Logan Cerny has been the team’s closer. Sophomore right-hander Miles Garrett has gotten the start when the team has faced a Game 3. With both team’s featuring strong pitching, Parkview coach Chan Brown said he expects some low-scoring games. “We’ve just got to execute and make plays,” said Brown, who has Parkview in the state championship series for the fourth time since he took over in 2005. The Panthers are playing in the championship series for the third time in four years. On offense, outfielder Michael Bryant, Cerny, Bennett, Jonathan French, Isaiah Byars and Ben Markiewicz have sparked the team. Brown and Jones share a special friendship. The two were inducted together into the Georgia Dugout Hall of Fame 2018 class and have mutual respect for each other’s program. Where: State Mutual Stadium, Rome, Ga. There aren’t many things that get Pope High School baseball coach Jeff Rowland fired up. But when fans and media start to talk about his program becoming a dynasty, Rowland wants none of that talk. Pope and Rowland are chasing their second state title in as many seasons. The Greyhounds also won state titles in 2009 and 2013, and they finished as the state runner-up in 2016. Pope will have to go through Allatoona if the Greyhounds are to capture a fourth state title in a 10-year span. The two Cobb County rivals will meet Tuesday at Rome’s State Mutual Stadium for the GHSA Class 6A state championship series. The best-of-three series will begin with a doubleheader at 5 p.m.
Allatoona is playing in its first state championship series in its 10-year history. The Buccaneers made the state semifinals in 2015. The Greyhounds (32-7) lost a wealth of talent from their 2017 squad. But after a 3-3 start, Pope found its identity, winning 29 of its next 33 to make it back to the championship round. While last year’s shutdown pitching rotation of Jared Miller and Ryan Miller are gone, this year’s pitching rotation has been especially strong. Max Pralgo, Scotty Lesieur and Reid Robertson have carried the bulk of the load, but the bullpen of Andrew Herlitz, Harris East and Nate Shipley has been strong. Allatoona lost two of its top pitchers to injuries (Kyle Reichert and Dalton Halyard), but the young staff hasn’t failed. Matt Martin and Evan O’Brien have been strong. Meanwhile, freshmen twins Fisher and Hunter Paulsen and Tyler Shultz have thrown complete-games in the postseason. Zach Popilek has also helped out as well as Hunter Woodall, who has been strong coming out of the bullpen. Allatoona coach Keith Hansen said he has encouraged his pitchers to let the defense help out. Offensively, Pope is led by shortstop Buddy Floyd and versatile Caden Smith. Pralgo and Antonio Jareno have been solid. Eeles and Evans are both hitting near .500. Smith, Brett Blomquist, Greg Boland and Messick have all been significant contributors for Allatoona on offense. Hansen said he likes the makeup of his team. Where: University of Georgia's Foley Field, Athens, Ga. It was a moment that Buford coach Stuart Chester viewed as a learning experience. In mid-April during the first of two games against Loganville, Chester's Wolves trailed 2-1 and had the bases loaded but failed to score, eventually losing the game by two runs. Buford lost both games to Loganville during the regular season – 4-2 and 8-1. However, the Wolves haven’t lost since and will get another crack at Loganville in the GHSA Class 5A state championship series that begins with a doubleheader Monday at 5 p.m. at Georgia’s Foley Field in Athens. The Region 8 rivals haven’t lost in the postseason and both have recent championship game experience. Loganville, the region champion and defending state champion, is playing in its third consecutive state championship series. The preseason No. 1 has lived up to its expectations and is playing its best baseball of the season. The Red Devils have won 20 straight and are searching for their fourth state title since 2008. Buford (28-11) is in the state championship series for the third time in four years. The Wolves captured a state crown in 2015 and finished as the state runner-up in 2016. Buford has won 11 straight since dropping a pair of games to Loganville. The Wolves have swept Rome, Decatur, Ola and Flowery Branch by a combined 62-14. Chester is in his first season at Buford after helping develop Cartersville into a state power before leaving after last season. The Georgia Dugout Club Hall of Fame coach guided Cartersville to nine berths in the state finals. He won six titles. While the Wolves have gotten solid production throughout their lineup, the pitching rotation of Ramsey David and Sean Adams have made things look easy. But leadoff hitter Austin Turner, Evan Place, Noah Ledford, Reece McIntyre, Grant James, Brandon Jolliff, Garrison Price and Griffin Price have helped Buford put up some impressive numbers on offense. Loganville (33-6) has relied heavily on a strong pitching rotation consisting of Joseph Brandon, Bay Witcher, Seth Clark, Connor Bruce and closer Bryant Pietri. But the offense has scored enough runs to keep the pressure off the rotation. Pietri, Brandon, Witcher, Tanner Green and leadoff hitter Dylan Strickland have been consistent at the plate. But Loganville coach Jeff Segars knows his team has its hands full. Jefferson baseball coach Tommy Knight quickly pulled the plug Wednesday on any celebration after his Dragons swept nationally ranked Blessed Trinity in the GHSA Class 4A state semifinals. When the team returned to practice, Knight had a message waiting for his team. Jefferson’s next order of business is meeting perennial power Cartersville in the Class 4A state championship series on Monday at State Mutual Stadium in Rome. The best-of-three series starts with a doubleheader at 5 p.m. It will be Jefferson’s first trip to the state championship series since 2015. Cartersville, who won five state titles from 2001-12, is playing for its first state championship since finishing as state runner-up in 2014 winning the Class 3A title in 2013. Knight said his team is enjoying the moment. The Dragons needed three games to oust Chestatee in the first round, swept Northwest Whitfield, then needed three games to best Woodward Academy. Patrick Hickox, Lance Watkins and Vinny Farley have gotten most of the innings on the mound. Freshman Derek Vaughn has performed admirably as the team’s closer. Offensively, shortstop Zac Corbin, Watkins, catcher Mason Cooper, Billy Finch and outfielder Justin Cole have sparked the team. Knight said others have stepped up in key situations such as Sam Elegreet and Kade McNally, whose walk-off homer in the first round against Chestatee helped the Dragons to a big win. Longtime assistant Kyle Tucker is in his first season with the Hurricanes and has them back in a familiar spot –playing for a state title. While it has been five years since the last title, Tucker and his team aren’t taking anything for granted. Cartersville has the talent. The Hurricanes swept Pickens in the first round, then needed three games to eliminate defending state champion Marist in the second round. Cartersville swept Spalding and Heritage-Catoosa in the next two rounds. The pitching staff has been strong with Mason Barnett, Gage Morris and Cohen Wilbanks. Making it even tougher, the Hurricanes have used All-American and ambidexterous pitcher Anthony Seigler as their closer. On offense, Preston Welchel, Nate Gooch, Devin Warner, Josh Davis, Justin Wilkie, Barnett and Seigler have provided plenty of support for the pitching staff. Tucker knows the challenge his team faces against Jefferson. Where: Mercer University's OrthoGeorgia Park, Macon, Ga.
As much as Westminster coach Chad Laney doesn't want the state championship series to be about him, the journey to the top for the popular coach is a story in itself. As a former player under Georgia Dugout Club Hall of Fame coach Jim Jefferson, Laney came back in 2001 as an assistant and has done a little of everything in the baseball program. He coached the ninth-grade and junior varsity programs for many seasons. He was an assistant when the Wildcats won the Class 3A state championship in 2016 under former coach Russell Wrenn. When Wrenn got a chance to go back home to Maryland, Westminster turned to Laney. The Wildcats are back in the state championship series where they will meet Lovett Monday at Mercer University's OrthoGeorgia Park in Macon. The best-of-three Class 3A doubleheader begins at 5 p.m. with a third game, if needed, to be played on Wednesday. No team in the state is hotter than Westminster (24-11), who has won 17 straight and has swept Haralson County, Greater Atlanta Christian, Cook and Ringgold. But they will have their hands full against Region 5 rival Lovett, whose campus is less than two miles from Westminster. Lovett (26-10) is also seeking its second state title in three seasons and fifth since 2005. The Lions defeated Wesleyan for the Class 2A title in 2016. The two teams split their season series with Westminster capturing the first game 9-0 on March 28. Then Lovett took a 2-1 decision on March 29. Westminster edged out Lovett for the rugged Region 5 title, winning the crown. Lovett finished as the region's No. 2 seed. "These guys, they just love playing together," Laney said. "They have a good time, but they take the game very seriously." Two-time all-state selection Ryan Miller has sparked the offense for much of the season, but Parks Harber, Peter York, Ben Forte and Ward Croft have helped score plenty of runs for pitchers Luke Jannetta and Jack Polhemus. The Wildcats haven't had to use lefties Jonathan Morgan and Edward Shores since they have yet to play a Game 3 in the postseason. Lovett has relied heavily on a formidable offense that can play the proverbial small ball as well as hit for power. But the biggest strength has been a deep pitching staff that has gotten the job done in the postseason. Senior right-hander Ben O'Meara emerged as the leader midway through the season and has come up big in the postseason. After helping Lovett win the first game of its second-round series against North Hall, O'Meara had 28 pitches he could throw in a decisive Game 3. He ended up throwing three innings in the nine-inning victory. While O'Meara has been the leader on the hill, Lovett has gotten quality innings from Dhruv Patel, Lance Beck, Grayson Nix, Wyatt Nelson, Charles Gibson and left-hander David Underwood. Lovett coach Lance Oubs knows the rivalry will go into a higher gear. "Chad (Laney) has done a great job picking up from where Russell (Wrenn) left off," Oubs said. "The kids love him and they are fundamentally sound. They play all aspects of the game well. It's going to be a big challenge for us." Where: Grayson Stadium, Savannah, Ga.
Berrien coach Doug Nix didn't think much about the significance when his program honored the school's 1988 state championship baseball team during a ceremony in between a pair of region baseball games on April 13. That team went 31-0 and is one of the last programs in state history to go undefeated in a season. Evans High School went undefeated at 29-0 a year later. But that night, there seemed to be something more for the current Berrien players than just honoring a group of players who hoisted the school's last baseball championship trophy. "We told them those guys were just like them," said Nix, who played at Berrien but graduated a year before the undefeated season. "I don't know if that was part of the puzzle (this season) or what." It may not have been, but it certainly didn't hurt. After finishing second in Region 1, the Rebels (27-13) have made their way to the state championship series to the surprise of many. Berrien has knocked off Vidalia, Dodge County, Heard County and defending state champion Jeff Davis. They will meet Region 2 champion Benedictine (29-7) on Monday at Grayson Stadium in Savannah. The first game of the doubleheader begins at 5 p.m. If a third and deciding game is needed, it would be played on Wednesday in Savannah. The powerful Cadets are in the state championship series for the first time since winning the Class 2A title in 2014. With the exception of a 10-0 loss to Callaway in Game 1 of the state semifinals, Benedictine had crushed Early County, Screven County and Social Circle. They promptly regrouped in Games 2 and 3 and outscored Callaway by a combined 20-5 to win the series. In nine postseason games, the Cadets have outscored their opponents 95-28. Berrien has used a 1-2 pitching punch of right-handers Rhett Thomason and Brock Jewell to keep its opponents off-balanced. The two right-handers have been effective. Meanwhile, outfielder and pitcher Darius Tisby has been on an offensive tear in the postseason. Benedictine has put up plenty of runs with senior Johnny Richardson and freshman star Carter Holton leading the way. On the mound, Garrison Gunby, Luke Whetstone and Walker Barlow have shut down the opposition. As impressive as the Cadets have been this season, coach Kevin Farmer knows defeating Berrien will be a challenge. Gordon Lee coach Mike Dunfee told his team the facts after they came up short in the Region 6 championship game to Mount Paran Christian last month. The Trojans (26-8) have rolled into the GHSA Class 1A Public School championship series for the second straight season, sweeping Clinch County, Charlton County and Bowdon in postseason play. Gordon Lee will play Telfair County, which also is on a roll of its own, in the best-of-three championship series that begins Tuesday at Grayson Stadium in Savannah. For Gordon Lee, it’s the fourth time in Dunfee’s seven seasons at the school that he’s guided the Trojans to the championship series. Gordon Lee, however, hasn’t won a state title since 1984. Telfair County is playing in its first state baseball championship series in school history. The core of Gordon Lee’s 2017 run to the state championship series returns, including standout pitcher Austin Thompson who was injured for most of the season. He has been lethal on the mound in a pair of postseason victories. The team also returned pitcher Caleb Hopkins, Mason Pettigrew and catcher Dylan Minghini. The Trojans’ veterans have also blended well with a wealth of youth. Thompson, Hopkins and Pettigrew as well as freshman Jake Poindexter have started most of the games on the mound, but Jake Wright, Logan Streetman and Will Sizemore have been strong in middle relief. Hunter Hodson has been the team’s closer. On offense, Minghini, Thompson, JD Day, Hodson and Sizemore have produced excellent numbers. Telfair has also been on a hot streak. After finishing third in Region 2, they swept Lanier County, Baconton Charter and Irwin County. Mercer said he noticed something different about his club in Game 2 of the second round against Baconton Charter. The Trojans were down 7-2 in the sixth inning, then rallied and ultimately prevailed 8-7 to sweep the series. Then in Game 1 against Irwin County in the semifinals, Telfair led 5-0 but allowed Irwin to tie the game. However, they scored three more to win the first game of the series 8-5 enroute to a sweep of the team that defeated them twice during the regular season. A pair of three-year starters have led the way on the mound for Telfair – senior Ryan Dopson and Ian Blankenship. Dopson’s younger brother, Jarrett, has also logged some key innings down the stretch. On offense, Ryan Dopson, Blankenship, and sophomores Trey Bess and Cameo Blankenship have provided a major spark. Prince Avenue Christian coach Phil Roberts knew something had to change if his team’s season was going to continue. In the GHSA Class 1A Private quarterfinals against defending state champion Savannah Christian, the Wolverines had been run-ruled in a 12-0 loss in Game 1, and they were trailing 2-0 in the second game. The Wolverines (24-10) then ousted Holy Innocents’ in three games to earn their first appearance in the GHSA Class 1A Private state championship series. Prince Avenue Christian will meet Tattnall Square in the best-of-three championship series that begins Tuesday at Mercer University’s OrthoGeorgia Park in Macon. The doubleheader begins at 5 p.m. It will be the third straight state championship series appearance for Tattnall Square. Since coming over from the Georgia Independent Schools Association in 2014-15, the Trojans have played in the semifinals (2015), won the Class 1A Private state title (2016) and lost in the state championship series in 2017. Both teams feature strong pitching rotations. Prince Avenue Christian has mostly used Trey Felt, Danny Westbury and Cain Tatum as its starters, then turned things over to reliever Thomas Ross. The junior right-hander has 11 saves, including two in the series victory over Savannah Christian. He also saved the pivotal Game 3 against Holy Innocents’ in the state semifinals. Tattnall has used dominant pitching from Luke Laskey and Brooks Gorman to roll though the postseason. The duo hasn’t had to sweat much. In six postseason games against Brookstone, Wesleyan and First Presbyterian Day, the Trojans won those games by a combined 61-13. The Trojans struggled some early in the season, but coach Joey Hiller said he noticed the team come together during a spring break trip to Saint Simons Island. Offensively, Prince Avenue’s Luke McDevitt, Ross and Tatum have provided plenty of spark, while junior Shelby Davis has come up with several clutch hits in the postseason. Davis had a two-run double to help the Wolverines beat Savannah Christian, and he also added a two-run RBI single during a three-run second inning in Game 3 against Holy Innocents’. Dawson Brown, Tattnall’s No. 9 hitter, is batting .500 in the postseason and leads an offense that is full of big hitters. BJ Spears, Austin Marchman, Trey Ham, Logan Fink, Laskey and All-American Kendall Logan Simmons have provided plenty of firepower this season. Roberts is in his first season at Prince Avenue Christian since coming over from Strong Rock Christian. He is the fourth coach in as many seasons and he credited the team’s four seniors – McDevitt, Felt, Westbury and second baseman Mikey Talmadge – for staying loyal to the program. He said it has been fun watching this team grow.